Zoho CRM REST API | Build apps and integrations. Your apps and integrations, powered by Zoho CRM. Zoho CRM offers the perfect collection of APIs and software development kits(SDKs) for building exciting new apps, for businesses of all sizes. The APIs are also secured by OAuth2.0 authentication protocol to enable seamless integration of your Zoho CRM account with any third-party application. Bulk API is optimized to retrieve / upload large amount of data in a single API call, thereby reducing the number of API calls. This is an asynchronous API and is great for performing tasks as a background process such as initial data sync between Zoho CRM and external services. Keep track of all the changes that occur to your data by subscribing for instant notifications. You get notified for changes or additions to any component in your Zoho CRM account. Say goodbye to polling for updates on data changes. Get notified only when changes occur. Use Query API to write your own queries to filter and get data from Zoho CRM. Similar to MySQL, CRM Object Query Language(COQL) uses the SELECT query to fetch records from Zoho CRM. The simple query structure, along with supported comparators, covers a wide range of search possibilities and allows you to fetch as many as 200 records in a single API call. Use Zoho CRM's API libraries to develop apps in the language you're most comfortable with. Our server-side libraries provide you with wrappers for all of Zoho CRM's APIs so that you don't have to write too many lines of code to get the job done. Get insight on your account's API usage. 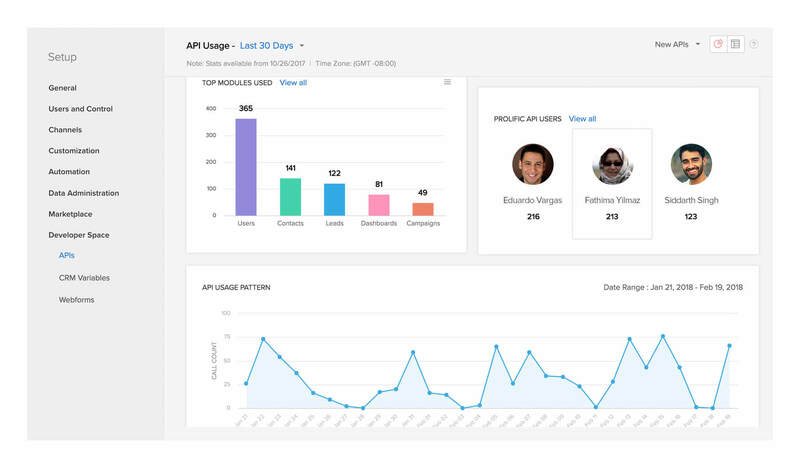 Track your account's API usage and get in-depth information about your top API consumers, API usage pattern, average daily usage, usage access points, and top API methods used, through Zoho CRM's intuitive API usage dashboards. Create amazing apps with minimum effort, using Zoho CRM REST API.